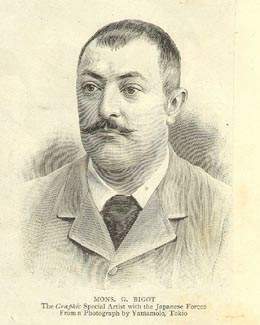 Georges Bigot, a French painter and sketch artist, resided in Japan from 1882-1899. Initially he taught drawing at the National Military Academy. He married in Japan and had a son, Maurice. Georges Bigot and Charles Wirgman (See The Japan Punch) are both noted for their satirical sketch art in Japan. In Japan, Bigot's art appeared in a number of works. It is said that he published over 30 books/albums with his sketch art. Additionally, it is believed that he published or contributed to over 100 different periodicals (most in Japan and a few in Europe). It has been reported that Bigot was engaged in amateur photography in Japan but I have found no photographic images attributed to him recorded in publications or offered on the market. In 1899 he divorced his wife, Masu, and departed Japan with his son. He returned to France where he remarried and began a career producing satirical drawings (Epinal prints), sketches for magazines and later landscape paintings. Many of the landscapes were of Japanese scenes. For a listing of books and periodicals associated with Georges Bigot, click here. Two recent articles regarding Georges Bigot are outlined below. Bigot's work in Japan was multi-faceted. He produced individual works for patrons, very limited edition books of etchings and mass marketed works in lithograph form. He worked in several mediums (water color paintings, sketches, etchings and lithographs) across a wide spectrum of subjects. He lived in Japan during an era of rapid modernization and assimilation of Western technology, ideas, values and styles. Much of his work appears to be an effort to capture images of the old pre-modernization Japan. On the other hand, he was keenly aware of where Japan was headed and sought to show that in his work. These images tend to be more in the nature of satire and along the line of what we now call cartoons. 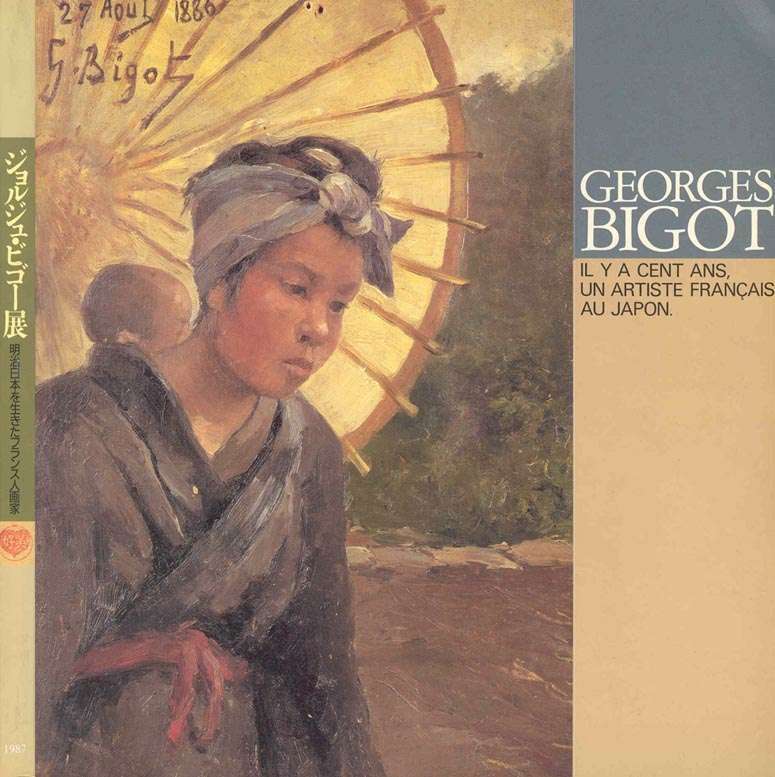 Books and Articles on Georges Bigot. Georges Bigot: Ill y a cent ansa, nun artiste Francis auk Japan, Tokyo, Reunion desk Musees Japonais and Journal Yomiuri, 1987, square 8vo (9 x 9 1/2 in - 23 x 24 cm), text in Japanese and French, soft wraps, front cover illustrated with Bigot painting of a young lady carrying a child, 773 numbered illustrations of Bigot's work, 198 pp. An exhibition catalogue. This exhibition toured Japan and Paris from March through October of 1987. The catalogue is divided into two parts - works in color (386 numbered illustrations) and works in black and white (387 numbered illustrations).Often a numbered illustration contains sub-parts so there are far more than the 773 numbered illustrations. At the back are two sections with notes on each numbered illustration. The color illustrations show Bigot's works in Japan in water color, oil on canvas and pen & ink. The black and white illustrations show Bigot's sketch work as depicted in actual drawings or contained in various published formats (etchings, reproduced in lithograph and photo-mechanically reproduced). While Bigot's work before and after Japan are shown in this part, the vast majority are from the period when he lived in Japan. The black and white section also reproduces 6 photographs (#339) which appear to be his wife and son. A important and richly illustrated listing of Georges Bigot work in Japan. To see the cover, click here. Georges Bigot's Secret Life as an Epinal Print Artist, published in Daruma, Japanese Art & Antiques Magazine, Issue 33, Vol. 9, No. 1, Winter 2002, Japan, 8vo, illustrated stiff wraps, 58 pp. The article on Georges Bigot covers pages 37 to 46. It is illustrated with 18 figures. A discussion of Georges Bigot's work after he returned to France in 1899. The "Epinal Prints" were color lithographs of a cartoon type nature presenting short stories/tales. They received the name because they were produced by the Jean-Charles Pellerin in the town of Epinal in France. Many of the prints were anonymous but Bigots name or identification is contained in some. Many but not all of the Bigot prints depict Japanese scenes. Other articles in this issue deal with Maki-e lacquer items, Netsuke carvers and Namikawa Sosuke. To see the cover of this issue, click here. Georges Bigot's Passion for Japan, published in Daruma, Japanese Art & Antiques Magazine, Issue 35, Vol. 9, No. 3, Summer 2002, Japan, 8vo, illustrated stiff wraps, 58 pp. The article on Georges Bigot covers pages 38 to 45. It is illustrated with 16 images. An informative and finely illustrated discussion of the French artist, Georges Bigot, with the primary focus on the 17+ years (1882-1899) he spent in Japan. An important reference work for the collector of Bigot's work. Several of the illustrations reflect Bigot's work in the satirical "Toba-e" form of sketch art. Other articles in this issue deal with Japanese Combs and Hairpins and Japanese Ceramic Tea Jars. To see the cover of this issue, click here. Bigo Sobyoshu, Iwanami Bunko (2003) and Zoku Bigo Sobyoshu, Iwanami Bunko (2001), Tokyo, Iwanami Shoten. Images de L'ere -- Le Monde de Georges Bigot, un Artiste Francqis au Japon, ("Images of the Meiji Era - The World of Georges Bigot, a French Artist in Japan"), 2002, Kawasaki, Japan, Yamakawa Company, 4to, soft cover with illustrated dust jacket, 192 pp. Extensively illustrated in color and black and white. Covers Bigot's works in France before and after 20 years in Japan as well as his books, drawings, sketches and paintings while in Japan. Also provides biographical information on Bigot. In Japanese except for some captions to images which also include the English translation. A comprehensive review of Bigots work including his paintings, drawings (many published in The Graphic, La Vie Moderne and Journal des Voyages), satirical art and books. To see the dust jacket, click here. ISBN 4-634-60590-2. Books and Publications By Georges Bigot or Featuring his Work. For spcific information on publications with Georges Bigot's art, click here. This portrait of Mons. G. Bigot appeared in a Supplement to the October 27, 1894 issue of The Graphic (Whole No. 1300).